For the class parties this year, the other class moms and I met and decided on several activities and games. This gives the kids more choice in what they'd like to do when they are done with the other parts of the party. Here's a sample of just some of the ideas we all had, and some that we will actually be doing at our party this year. Using posterboard and brown cardstock, Spoonful.com has a cute spin on the typical Pin the Tail on the Donkey party game. 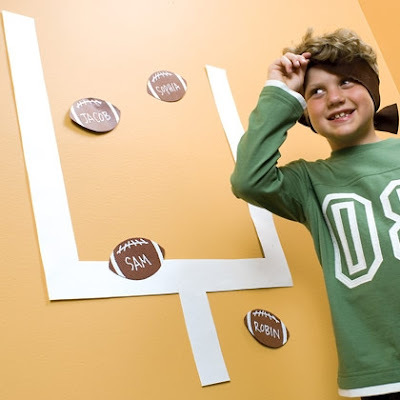 Click on the image above for complete instructions on this fabulous fall wall football game. Every class party I have been to has BINGO. The kids are crazy for it. They love trying to be the first one to reach BINGO and they enjoy looking to see if they have what is called. Not sure why, but they do. They just don't outgrow the fun! So we are including it for sure this year. It will have a fall theme. There are so many cute options out there for pre-made, downloadable cards as well as cute cards that provide great inspiration for making some yourself. Here are just a few that I managed to find. 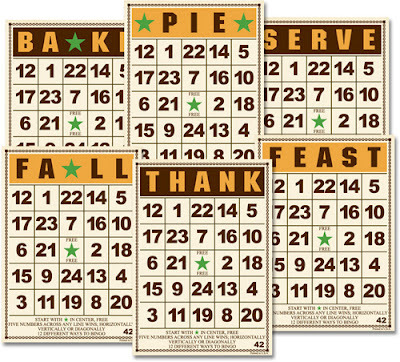 You could do the same with a variety of fall-themed rubber stamps you have on hand. They would take a bit of prep, but they are so darn cute. 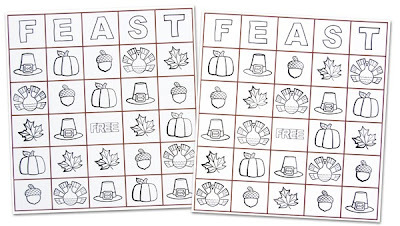 For a traditional autumn BINGO game, this is a darling set of BINGO cards made by Jenni Bowlin. It uses the normal letter and number format. This set is actually a mini version of cards made for scrapbooks on heavyweight cardstock, but wouldn't this make a great inspiration for your own DIY set? I love the colors and the titles used instead of the typical BINGO across the top. And here is a card using just words. 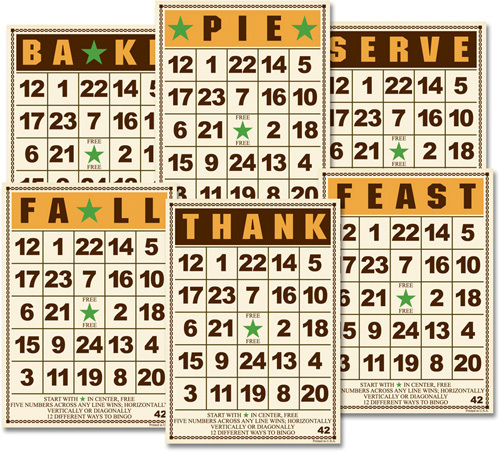 This particular card is from BingoCardCreator.com, where you can register to download ones they already have made, or you can purchase the program and make your own. They also have word lists for you to use if you don't have some of your own in mind. DLTK-Holidays even has an online area where you can play various online word games. I'll have to remember that on those future rainy days when all I hear is "I'm bored!". Have the kids make a large leafpile to jump into and then take a class photo of them in the pile or jumping into it. Would make an adorable photo for the yearbook. Do a marshmallow roast using a portable outdoor firepit. Do a scavenger hunt. Have the kids look for fall items, either in groups or individually. See how many different things they can find for the same item description. Geocache. This of course would take some serious prep work, but would be so cool for the kids to use their noggins and sense of exploration. Inside, you could certainly do a scavenger hunt in the classroom, or if you have permission, maybe even throughout the school. Another thought is to have the kids make a classroom scarecrow. Gather up a bunch of newspaper, old clothes from mom and dad and have them make a lifesize scarecrow to decorate their classroom. I hope that this list has given you a good jumping-off point to planning your next fall class party or birthday. Hi Mollie! Do you have downloads of any of the above activities? Well, Katie, likely you don't need my answer any longer. Sorry for the long delay in getting back to you. I do not have downloads at this time, but you can get to each of the activities by clicking on the images. I plan to have my own versions ready for next year. Thanks for stopping by!